Glittered Pumpkins How-To1. With paintbrush, spread layer of white glue over the surface of a small pumpkin. 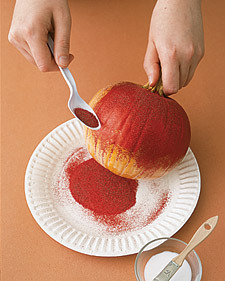 Place pumpkin on a paper plate or newspaper to catch excess glitter. Tips1. It's easiest to do half the pumpkin and sprinkle with glitter, let dry, and continue with the other half. 2. There's no need to completely cover the bottom, since it's not seen. Also, it's fine if your pumpkin has marks or mild blemishes, since you will be covering it with glitter.